While the sub-prime mortgage debacle and crumbling housing market continue to get lots of attention from the mass media and most financial outlets, the real story now for investors is corporate profits. Companies began reporting their second quarter corporate profits two weeks ago and here's what we're seeing thus far: large international companies that derive a substantial portion of their revenues from sales abroad, such as Boeing (BA), Colgate-Palmolive (CL), and Coca-Cola (KO) are experiencing profit increases, while domestic companies whose revenues are generated primarily from sales in the U.S., such as Charter Communications (CL), Wilson's Leathers (WLSN) and Whole Foods (WFMI), are realizing losses. Meanwhile, defense contractors, such as Northrop Grumman (NOC) and General Dynamics (GD) are also seeing their profits grow as a result of the war in Iraq and Afghanistan. You should expect this trend to continue over the coming weeks, as a result of strong economic growth in China, India and other emerging economies, while the U.S. economy continues to slow and the dollar plummets. On days during which large international companies and defense contractors report earnings, you will probably see the major stock market indices rally. But when smaller domestic companies report their second-quarter profits, expect to see stock prices drop. Although the Dow Jones Industrial Average may continue to rise over the coming weeks, I expect the small-cap Russell 2000 Index to continue trending lower. 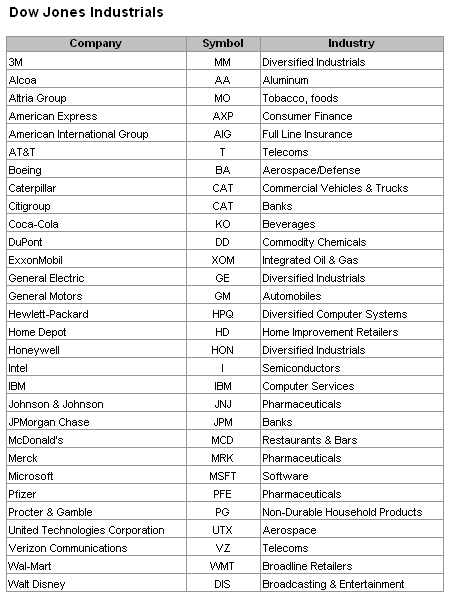 As you can see in the table below, the Dow is comprised primarily of large international companies. In contrast, the Russell 2000 is made up of much smaller companies that cater primarily to U.S. consumers and businesses. Over the past three months, the Dow has risen 5.9 percent, while the Russell 2000 has fallen 1.8 percent. Yet, you hear little, if any, discussion of this from the Wall Street "experts" or the talking heads on CNBC. However, we hear plenty about corporate buybacks and M&A activity. Although buybacks, M&As and private equity transactions may continue to support advances in the major stock market indices over the next few weeks, I urge you to keep in mind that, historically, whenever there was a continuing divergence between large-cap and small-cap indices, and when fewer and fewer companies began participating in the market's gains, a bear market usually occurred within the ensuing three months. (See my article entitled "Up, Up, and Away" dated July 18, 2007 for a chart of the recent divergence between the S&P 500 Index and the New York Stock Exchange ("NYSE") Advance-Decline line. (For those of you who are not familiar with the Advance-Decline line, this is a chart of the number of stocks traded on the NYSE that have been advancing in price less those that have been declining). Something else you should consider is that the back-to-school shopping season is just around the corner. With actual, as opposed to "government reported", consumer prices continuing to rise and home values continuing to fall, my indicators suggest there is a good chance retailers will experience their worse back-to-school season since 2001. Just this past month, the nation's retail chain stores reported that their sales for the month of June rose only 3.8 percent from a year ago, as compared to 5.0 percent in the previous month. So, while the major stock market indexes may continue to trend higher over the coming weeks, you should expect a lot of volatility. And, you should probably be starting to prepare for a new bear market, at least here in the U.S.